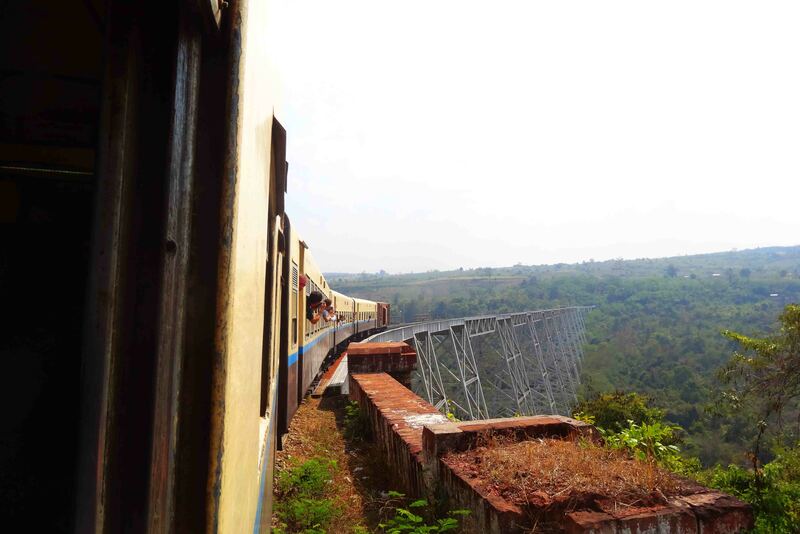 Welcome back to Myanmar, where the train rides are bumpy and adventuresome! 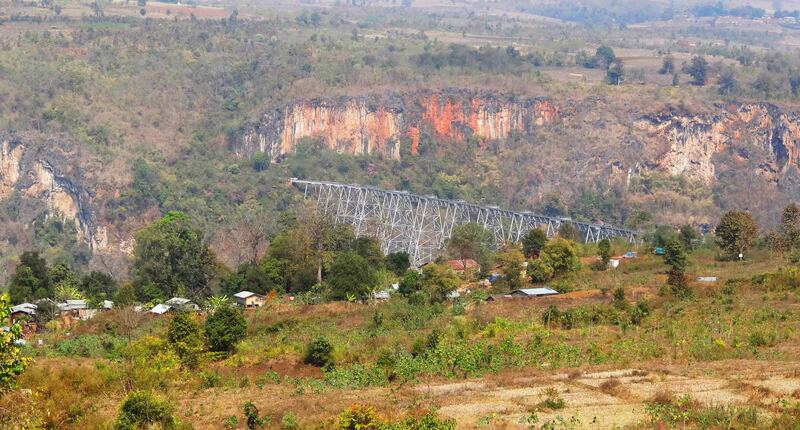 I love a little train ride with a good reputation for adventure, and here is one such ride, from Pyin Oo Lwin to Kyaukme (pronounced Chow-mei). 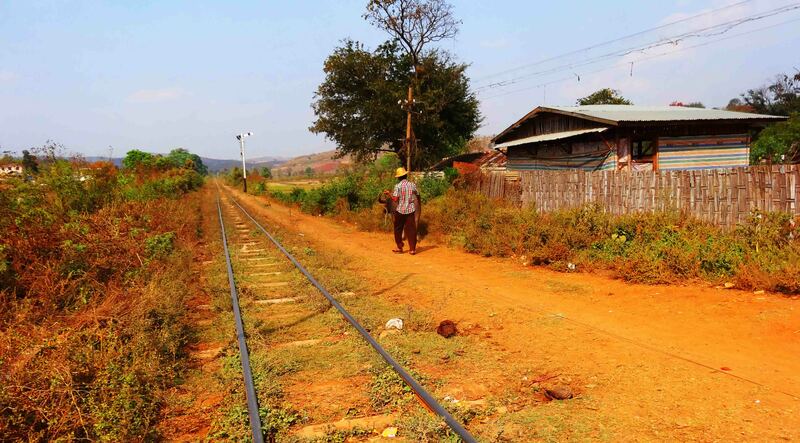 This is only part of the journey as the train goes further on to Hsipaw and Lashio, but this is the journey I did. 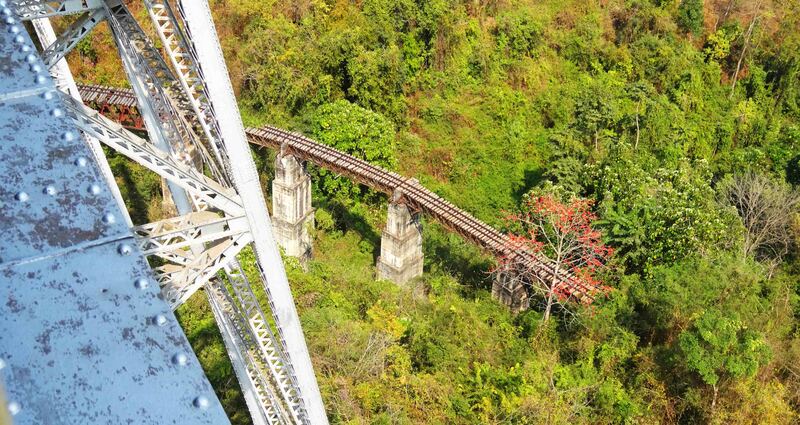 My main goal for taking the journey was to see and go over the Gokteik Viaduct, some 100 metres up and at the time it was built, at the turn of the 19th to 20th century. It was built by an American company, and at the time was one of the highest viaducts in the world. In fact, ever reliable wiki will tell you at the time it was the largest trestle bridge in the world. So. How about that then? It was my first morning in Myanmar, and the night had proven much colder than I had anticipated. The previous evening I had talked to the manager of the Royal Flower Guesthouse about my plan to take the train and he had told me that two days ago the train had had an accident, with a carriage uncoupling and then falling on its side at the Pyin Oo Lwin station. Advice was that maybe it wasn’t the safest option, as there’d been a similar accident the week before. At Pyinn Oo Lwin Station. 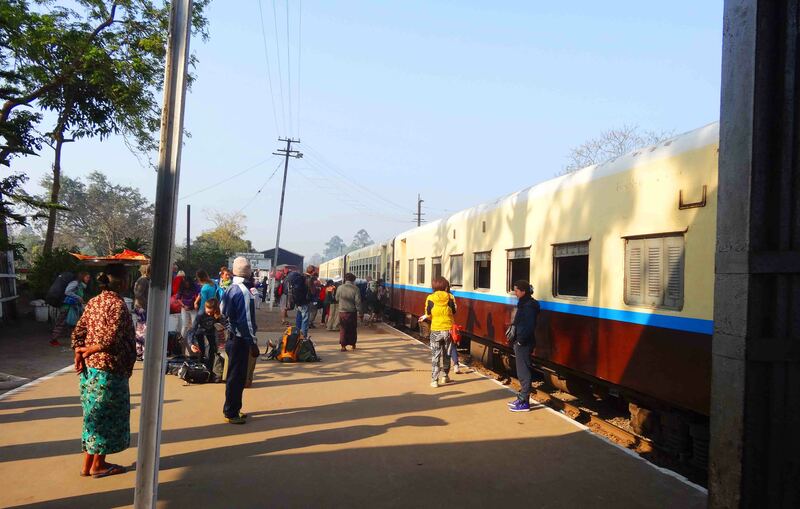 Nevertheless, I decided to take the train as it was the main reason I’d come to Pyin Oo Lwin, and I was told they took it so slowly that nothing really bad could happen. Other than rolling carriages on their side, obviously. And the viaduct was only 100 metres up too, so what was the worst that could happen? At the station the train was waiting. The previous day’s train had left at 12.40pm, and big delays were common, so just before 830am and the train was there, I was hopeful of getting away in good time. The ticket. Sometimes I feel we don’t need a caption. I bought un ‘Upper Class’ ticket – 1599 kyats (plus .50 kyat for insurance!) which was around $160 to Nawnpeng. Upper Class cabin turned out to have nice white seat covers over cushioned seats, and a carriage a tourists not put off or oblivious to the train’s recent ‘issues’. The seats were actually in a pretty bad way, but the white sheets disguised that to a point. I checked out the toilet. It was not for sitting on under any circumstances. The adjoining carriage, 2nd class, was basically just wooden seats and pretty empty. The carriages were in serious need of, well, replacing. There were holes in rooves and other places, they were dirty and were barely holding together. 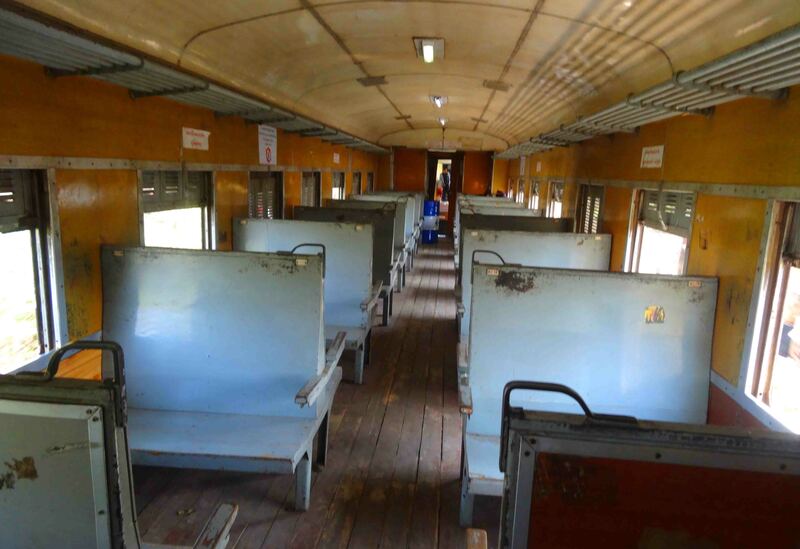 Wooden seats in an empty 2nd Class. Train workers went up and down the train checking the couplings and reinforcing them with fencing wire. The train must have had around a dozen carriages. Soon, it was after the 830am leaving time, and then it was after 10am. Just under two hours late the train left, despite arriving from Mandalay on time. 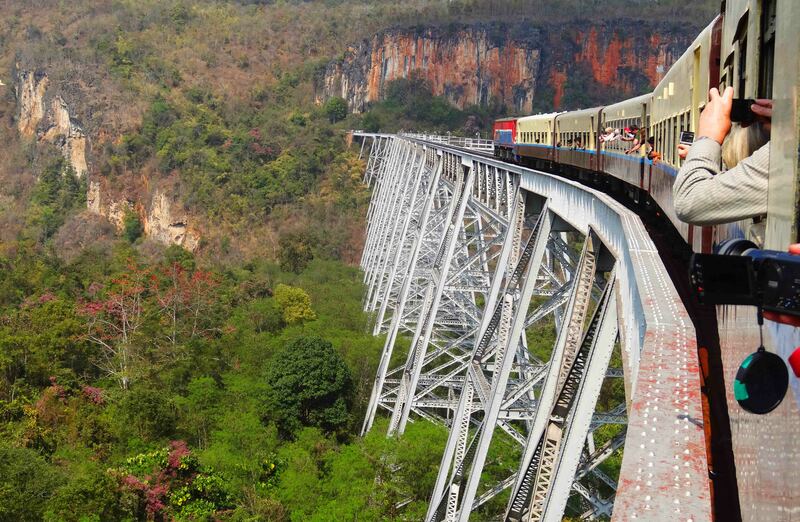 That is the way of the Burmese trains it seemed! We were moving at perhaps 25 km per hour, I can’t imagine the diesel-pulled train with an engine each end got any faster than that. The fields and forests were quite beautiful as we passed through a bit of rural life. The temperature hovered around 20 degrees, not much more. I moved into the 2nd class carriage for a bit as my chair in Upper Class faced backwards which I’m not a fan of. The train ride was the bumpiest I’ve ever had. At least until my next Burmese rail journey! At one point I was seriously worried the carriage was going to split from the wheels. Thankfully, that didn’t happen! Gokteik Viaduct as we approach. There were plenty of stops, and yes, everyone waves to the train when it goes past. This seems to happen in every country! The landscape got more rugged as we approached the Gokteik Viaduct. More mountainous, we must have climbed a bit too. Ladies entered the train with food and so forth for sale, mostly on their heads. 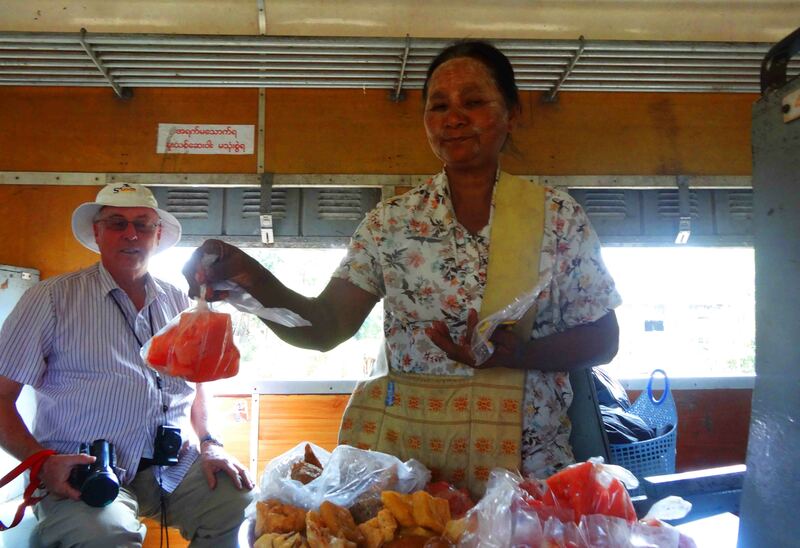 Buy your snacks on the train! The tourists stuck their cameras out the windows and anywhere they could find to take a shot. Yep, I include myself there! We stopped at the ‘Gokteik’ station probably around 2pm in the afternoon or a little later. Just a couple of minutes from the bridge, which we could see approaching the station across the hills. Old rail bridge. Used for what? I don’t know! The train took it really slow. I was told the maximum speed it could take the bridge was 7 miles per hour. In Myanmar, they are still on miles if you were wondering. It creaked a bit, and I confess I was really worried I was going to be pretty scared of the crossing. The valley was deep, on one side of the bridge there was another rail bridge some 80 metres or more below. But I was fine. The creaking wasn’t too loud. The views were stunning too. It had been well worth it as the diesel engines did their bit to keep us moving at 3 miles per hour. The bridge itself looked a little corroded. It seemed to be missing slats and I was surprised to hear tourists come out and walk on the bridge because that WAS something I don’t think I could have done. I am not good with heights. But I did love this bridge and this ride. After the bridge there were two longish tunnels (none before the bridge) and 20 minutes later we pulled into Nawnpeng. It was around four pm. That was decent time, five and half hours. It’s supposed to take five. For Myanmar, that’s not a bad effort. Getting back to Pyin Oo Lwin I was told was easy, but finding transport on the main road was really hard. Couldn’t hitch a ride and in the end had to wait for a big bus and pay the full fare to Mandalay even though I was only going half the distance. Got in after dark. Still, it had been a rewarding day and very special train ride! Do take a look at my six-minute video of the experience. the train rides are arduous but rewarding. two more coming but need time to compile videos. thanks for reading! actually wooden seats not too bad. But the upper class seats are less than 2 bucks so…. 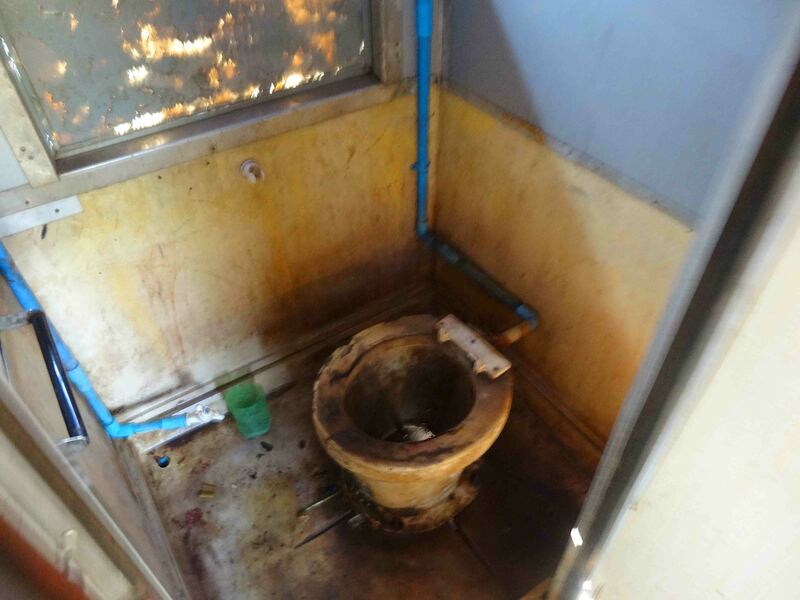 And I thought toilets in Russia were bad! toilets of the world! theres a book in that! russian toilets have that weird sort of shelf which ive never quite worked out. That’s for sure. Avoids the splash, if you know what I mean. Urgg, I might have been tempted before seeing the toilet. Now, not so much. try not to drink anything until the ride is over! 😉 you couldnt sit still on it the way the train moves anyway, even if it was a japanese super toilet! In Nawnpeng could I find a bus, van or shared taxi to go south to Pindaya (or Inle Lake)? Have you seen any place to ask for information? The further you move away from Pyin Oo Lwin the harder it would get I would think. You would probably need to get to Mandalay to find direct transport to Inle, Thanks for commenting!